Whether it is an eager child opening presents on their birthday, or the story of Pandora and her unfortunate curiosity, boxes have long-held a fascination for those who can't help but to sneak a peak. When an ominous box surfaces with the power to kill any who choose to look within it, it falls to London's finest archaeologist and his young apprentice to lift the fog of mystery. The full review of Professor Layton and Luke's latest adventure after you perform the ancient clicking ritual. At the heart of every Professor Layton game are the puzzles. Everything else within the games is window dressing designed to move you from one challenge to the next. Thankfully, the story in this game was more interesting than the first iteration. Rather than being confined to a single sleepy village, you will instead travel upon the Molentary Express, an old fashioned luxury train that makes stops in numerous locales (each of which has numerous puzzles and mysteries to solve). These changes in location keep the game feeling fresh, and these locations are varied in atmosphere, appearance and the people who inhabit them. 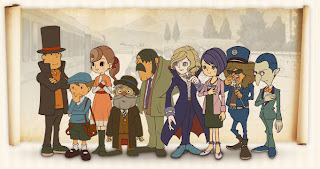 I've always liked the art style of the Layton games. The backgrounds that you meticulously comb with your stylus for hint coins are often warm and detailed in such a way that you'll want to examine every inch of them. The characters you meet (and in turn, receive more puzzles from) are fun, exaggerated personalities that will probably get a chuckle or two out of you with their various quirks. The Professor remains his usual gentlemanly self, and Luke provides some mild comic relief with his youthful enthusiasm and voracious appetite. The puzzles themselves are decent, yet I was a little disappointed to see some repetition with the puzzle types. Some were just more difficult versions of a type you had likely encountered earlier in the story, or even within the first game. Somewhat understandable given that only so many puzzle types exist to put into the game, but it did take away from the experience slightly. Thankfully, clearing the story mode is only the beginning of the game, as you will be able to unlock more difficult puzzles with Picarats, the currency you receive for solving puzzles within the story mode. Additionally, there are more puzzles available for download via the DS' wireless capabilities. As well, there are a few mini-games to occupy your attention should the main quest become too frustrating. They're not overly complicated (assembling an old camera from various pieces or brewing different blends of tea), but when you get to the point of wanting to snap your DS in half because of a tricky task, they come as a welcome distraction. These mini-games also confer rewards within the main story, so it is in your interest to revisit them as often as possible. Professor Layton is a series I would like to see thrive. It's a franchise that has a lot going for it, and it's a 3rd party one to boot, something the DS needs more of. Diabolical Box does a lot of things right in working towards this goal. More dialogue is voiced than the first game, the animated sequences are entertaining and the music is light and provides suitable accompaniment while you work on the latest brain-buster. I can't help but wonder if this series will run out of gas if it merely stays the course though. Eventually, the recycling of puzzle types is bound to catch up with them, and that's ultimately what keeps Professor Layton and the Diabolical Box from a stronger showing.